After the last game was played behind closed doors, it was very pleasing to hear that the U21s would grace Vicarage Road. Playing at the professional stadia is good for the youngsters’ development and it was all done properly with the teams coming out to Z-cars, although it was a bit baffling that the ‘respect’ line-up faced a couple of young players sitting in the SEJ stand rather than the paying customers in the Upper GT. Kewell named another young team (apart from the goalie), the starting XI was Gilmartin, Sesay, Young, Rowan, Mason, Byers, Mensah, Stewart, Lewis, Jakubiak and Folivi. As the teams were read out, their respective coaches were also named as Chris Morgan for the Blades and Harry Kewell for the Hornets, which prompted the guy in front to comment that the visitors all looked to be the size of Morgan while our lads were more in the mould of the diminutive Kewell, which was a little worrying. The young Hornets started brightly with Jakubiak playing the ball back to Byers who unleashed a terrific strike that drew a great save from Eastwood in the United goal. Mason then found Folivi who shot just wide. Folivi, who is a tremendously exciting talent, then entertained the crowd with an audacious nutmeg, it was a pity that his forward pass went begging. Watford threatened again as Sesay whipped in a cross that was headed just over by Jakubiak. The visitors look the lead against the run of play, as a ball over the top reached De Girolamo in the box, Rowan was in close attendance but the forward was too strong and out-muscled him to shoot past Gilmartin. The Hornets then put themselves in trouble as Folivi played a lovely pass to Jakubiak, who let it run not knowing that there was a United player behind him who picked up the ball and released Philips to run down the right wing, round the back of the Watford defence and cross for De Girolamo to score his second. Sheffield United were in control at this point, but the young Hornets tried to strike back as Jakubiak and Mensah exchanged passes but, sadly, the resulting shot was weak and deflected for a corner. At the other end, a free kick was headed on to Kennedy whose shot was also deflected wide. The crowd in the Upper GT thought that their side had pulled a goal back as Lewis unleashed a shot but, unfortunately, it found the side netting. Mensah then did well to hold the ball up, turn and release Folivi whose shot was well saved by Eastwood. Just before half time, the visitors had a great chance to increase their lead but Gilmartin pulled off a magnificent save to deny Wright. So the Hornets reached half time two goals down. There had been some lovely play from the home side but the visitors had gained the upper hand with their superior strength and finishing. 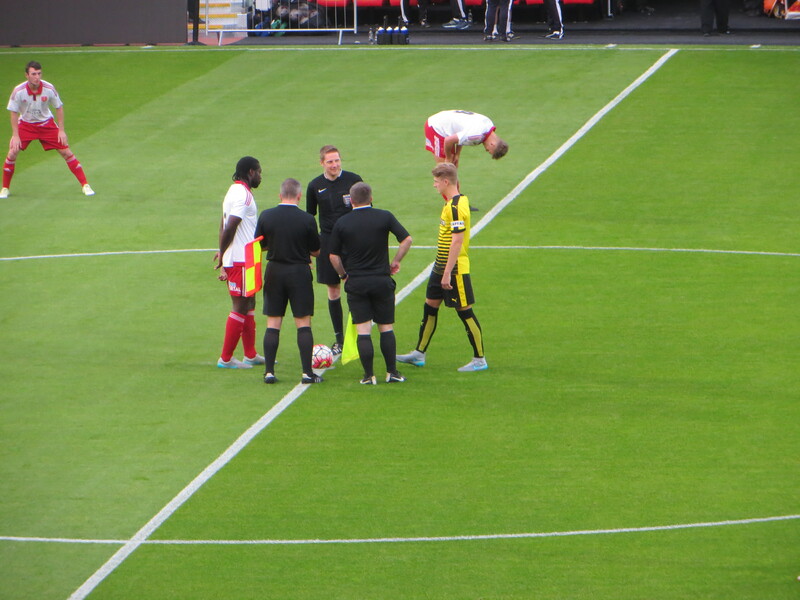 Kewell made a substitution at the start of the second half bringing Ashley Charles on for Carl Stewart. The first action of note was an altercation. I didn’t see what started it but did see Rowan holding one of the United players down. There were minor afters, but a yellow card was shown to the Watford man accompanied by a shout of “handbags” from the crowd. The first real chance of the second half came on the hour mark as Lewis went on a terrific run before skipping past a couple of defenders in the United box, sadly his shot was just wide of the near post. De Girolamo had a chance to get his hat-trick, but Rowan stood tall to block the shot. Kewell’s second change saw Mason replaced by one of the three trialists on the bench. The visitors had another decent chance to increase their lead but Gilmartin again did well to deny Flynn. There was another booking for the home side as a rather desperate late tackle earned Byers a yellow card. A forward break by Flynn was stopped as Sesay did well to get back and make the tackle. Flynn had another chance to get on the scoresheet, but a defender was on hand doing just enough to put him off so his shot flew wide of the target. With 10 minutes remaining, the Hornets went down to ten men as Byers lunged at an escaping player and was shown a second yellow card. Watford had one more chance to pull a goal back as one of the trialists curled a free kick goalwards. It was a tremendous strike, but Eastwood managed to keep it out. So the U21s have yet to win a game this season, although that record has more to do with the lack of players in this age group than the quality of the youngsters. 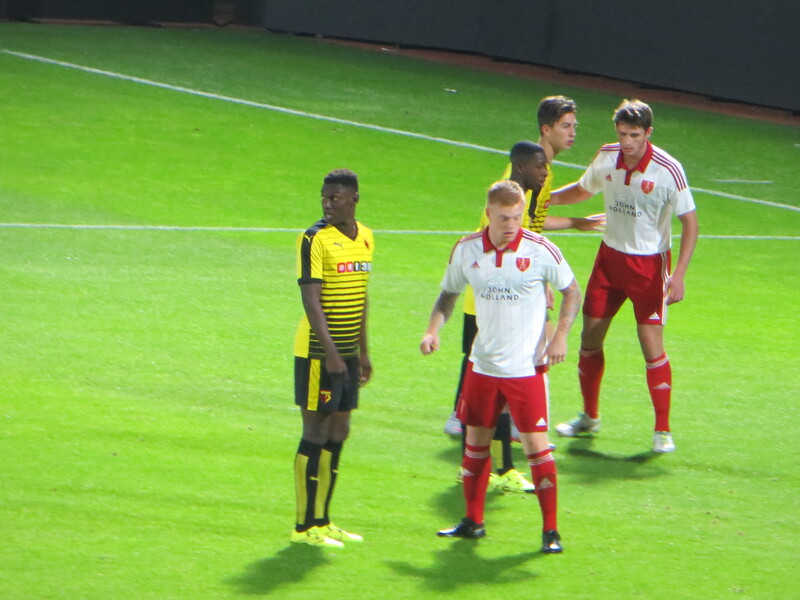 In the games that I have seen, the Watford players look considerably younger and smaller than their opponents. Still there were positives to take from the game. Jakubiak and Mensah were lively. Sesay, who is a first year scholar, made some impressive runs from the back. And the lads on the wings, Lewis and Folivi, did well. Of the Watford players on show, Folivi continues to attract attention. He is now in the second year of his scholarship and shows a lot of skill married to a fearlessness that augurs well for his future. He’s certainly one to watch. This entry was posted in Watford FC and tagged Alex Jakubiak, Alfie Young, Ashley Charles, Ben Whiteman, Bernard Mensah, Brandon Mason, C J Hamilton, Carl Stewart, Charlie Rowan, Chris Morgan, Connor Dimaio, David Sesay, Dennon Lewis, Diego De Girolamo, George Byers, Harry Kewell, Ioan Evans, Jake Eastwood, Jake Phillips, Jake Wright, Jamie McDonagh, Julian Banton, Kler Heh, Michael Folivi, Rene Gilmartin, Ryan Flynn, Shea Gordon, Sheffield United FC, Terry Kennedy, Watford FC on September 9, 2015 by franelynn.